Version 1.002. Last Updated: 01/28/2019. So teach him to search. In this project, your Pacman agent will find paths through his maze world, both to reach a particular location and to collect food efficiently. You will build general search algorithms and apply them to Pacman scenarios. See the autograder tutorial in Project 0 for more information about using the autograder. The code for this project consists of several Python files, some of which you will need to read and understand in order to complete the assignment, and some of which you can ignore. You can download all the code and supporting files as a zip archive. search.py Where all of your search algorithms will reside. searchAgents.py Where all of your search-based agents will reside. pacman.py The main file that runs Pacman games. This file describes a Pacman GameState type, which you use in this project. game.py The logic behind how the Pacman world works. This file describes several supporting types like AgentState, Agent, Direction, and Grid. util.py Useful data structures for implementing search algorithms. Files to Edit and Submit: You will fill in portions of search.py and searchAgents.py during the assignment. Once you have completed the assignment, you will submit a token generated by submission_autograder.py. Please do not change the other files in this distribution or submit any of our original files other than these files. Evaluation: Your code will be autograded for technical correctness. Please do not change the names of any provided functions or classes within the code, or you will wreak havoc on the autograder. However, the correctness of your implementation -- not the autograder's judgements -- will be the final judge of your score. If necessary, we will review and grade assignments individually to ensure that you receive due credit for your work. Academic Dishonesty: We will be checking your code against other submissions in the class for logical redundancy. If you copy someone else's code and submit it with minor changes, we will know. These cheat detectors are quite hard to fool, so please don't try. We trust you all to submit your own work only; please don't let us down. If you do, we will pursue the strongest consequences available to us. Getting Help: You are not alone! If you find yourself stuck on something, contact the course staff for help. Office hours, section, and the discussion forum are there for your support; please use them. If you can't make our office hours, let us know and we will schedule more. We want these projects to be rewarding and instructional, not frustrating and demoralizing. But, we don't know when or how to help unless you ask. Discussion: Please be careful not to post spoilers. Pacman lives in a shiny blue world of twisting corridors and tasty round treats. Navigating this world efficiently will be Pacman's first step in mastering his domain. If Pacman gets stuck, you can exit the game by typing CTRL-c into your terminal. Soon, your agent will solve not only tinyMaze, but any maze you want. Also, all of the commands that appear in this project also appear in commands.txt, for easy copying and pasting. In UNIX/Mac OS X, you can even run all these commands in order with bash commands.txt. In searchAgents.py, you'll find a fully implemented SearchAgent, which plans out a path through Pacman's world and then executes that path step-by-step. The search algorithms for formulating a plan are not implemented -- that's your job. The command above tells the SearchAgent to use tinyMazeSearch as its search algorithm, which is implemented in search.py. 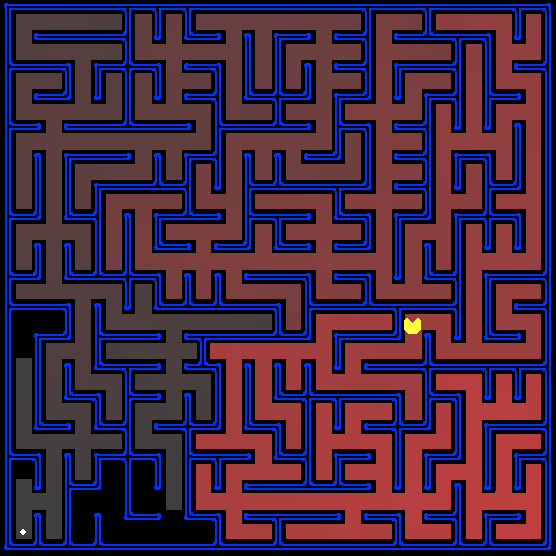 Pacman should navigate the maze successfully. Now it's time to write full-fledged generic search functions to help Pacman plan routes! Pseudocode for the search algorithms you'll write can be found in the lecture slides. Remember that a search node must contain not only a state but also the information necessary to reconstruct the path (plan) which gets to that state. Important note: All of your search functions need to return a list of actions that will lead the agent from the start to the goal. These actions all have to be legal moves (valid directions, no moving through walls). Important note: Make sure to use the Stack, Queue and PriorityQueue data structures provided to you in util.py! These data structure implementations have particular properties which are required for compatibility with the autograder. Hint: Each algorithm is very similar. Algorithms for DFS, BFS, UCS, and A* differ only in the details of how the fringe is managed. So, concentrate on getting DFS right and the rest should be relatively straightforward. Indeed, one possible implementation requires only a single generic search method which is configured with an algorithm-specific queuing strategy. (Your implementation need not be of this form to receive full credit). Implement the depth-first search (DFS) algorithm in the depthFirstSearch function in search.py. To make your algorithm complete, write the graph search version of DFS, which avoids expanding any already visited states. The Pacman board will show an overlay of the states explored, and the order in which they were explored (brighter red means earlier exploration). Is the exploration order what you would have expected? Does Pacman actually go to all the explored squares on his way to the goal? Hint: If you use a Stack as your data structure, the solution found by your DFS algorithm for mediumMaze should have a length of 130 (provided you push successors onto the fringe in the order provided by getSuccessors; you might get 246 if you push them in the reverse order). Is this a least cost solution? If not, think about what depth-first search is doing wrong. Implement the breadth-first search (BFS) algorithm in the breadthFirstSearch function in search.py. Again, write a graph search algorithm that avoids expanding any already visited states. Test your code the same way you did for depth-first search. Does BFS find a least cost solution? If not, check your implementation. Hint: If Pacman moves too slowly for you, try the option --frameTime 0. Note: If you've written your search code generically, your code should work equally well for the eight-puzzle search problem without any changes. While BFS will find a fewest-actions path to the goal, we might want to find paths that are "best" in other senses. Consider mediumDottedMaze and mediumScaryMaze. By changing the cost function, we can encourage Pacman to find different paths. For example, we can charge more for dangerous steps in ghost-ridden areas or less for steps in food-rich areas, and a rational Pacman agent should adjust its behavior in response. Note: You should get very low and very high path costs for the StayEastSearchAgent and StayWestSearchAgent respectively, due to their exponential cost functions (see searchAgents.py for details). Implement A* graph search in the empty function aStarSearch in search.py. A* takes a heuristic function as an argument. Heuristics take two arguments: a state in the search problem (the main argument), and the problem itself (for reference information). The nullHeuristic heuristic function in search.py is a trivial example. You can test your A* implementation on the original problem of finding a path through a maze to a fixed position using the Manhattan distance heuristic (implemented already as manhattanHeuristic in searchAgents.py). You should see that A* finds the optimal solution slightly faster than uniform cost search (about 549 vs. 620 search nodes expanded in our implementation, but ties in priority may make your numbers differ slightly). What happens on openMaze for the various search strategies? The real power of A* will only be apparent with a more challenging search problem. Now, it's time to formulate a new problem and design a heuristic for it. In corner mazes, there are four dots, one in each corner. Our new search problem is to find the shortest path through the maze that touches all four corners (whether the maze actually has food there or not). Note that for some mazes like tinyCorners, the shortest path does not always go to the closest food first! Hint: the shortest path through tinyCorners takes 28 steps. Note: Make sure to complete Question 2 before working on Question 5, because Question 5 builds upon your answer for Question 2. To receive full credit, you need to define an abstract state representation that does not encode irrelevant information (like the position of ghosts, where extra food is, etc.). In particular, do not use a Pacman GameState as a search state. Your code will be very, very slow if you do (and also wrong). Hint: The only parts of the game state you need to reference in your implementation are the starting Pacman position and the location of the four corners. Our implementation of breadthFirstSearch expands just under 2000 search nodes on mediumCorners. However, heuristics (used with A* search) can reduce the amount of searching required. Note: Make sure to complete Question 4 before working on Question 6, because Question 6 builds upon your answer for Question 4. Implement a non-trivial, consistent heuristic for the CornersProblem in cornersHeuristic. Admissibility vs. Consistency: Remember, heuristics are just functions that take search states and return numbers that estimate the cost to a nearest goal. More effective heuristics will return values closer to the actual goal costs. To be admissible, the heuristic values must be lower bounds on the actual shortest path cost to the nearest goal (and non-negative). To be consistent, it must additionally hold that if an action has cost c, then taking that action can only cause a drop in heuristic of at most c.
Remember that admissibility isn't enough to guarantee correctness in graph search -- you need the stronger condition of consistency. However, admissible heuristics are usually also consistent, especially if they are derived from problem relaxations. Therefore it is usually easiest to start out by brainstorming admissible heuristics. Once you have an admissible heuristic that works well, you can check whether it is indeed consistent, too. The only way to guarantee consistency is with a proof. However, inconsistency can often be detected by verifying that for each node you expand, its successor nodes are equal or higher in in f-value. Moreover, if UCS and A* ever return paths of different lengths, your heuristic is inconsistent. This stuff is tricky! Non-Trivial Heuristics: The trivial heuristics are the ones that return zero everywhere (UCS) and the heuristic which computes the true completion cost. The former won't save you any time, while the latter will timeout the autograder. You want a heuristic which reduces total compute time, though for this assignment the autograder will only check node counts (aside from enforcing a reasonable time limit). Remember: If your heuristic is inconsistent, you will receive no credit, so be careful! Now we'll solve a hard search problem: eating all the Pacman food in as few steps as possible. For this, we'll need a new search problem definition which formalizes the food-clearing problem: FoodSearchProblem in searchAgents.py (implemented for you). A solution is defined to be a path that collects all of the food in the Pacman world. For the present project, solutions do not take into account any ghosts or power pellets; solutions only depend on the placement of walls, regular food and Pacman. (Of course ghosts can ruin the execution of a solution! We'll get to that in the next project.) If you have written your general search methods correctly, A* with a null heuristic (equivalent to uniform-cost search) should quickly find an optimal solution to testSearch with no code change on your part (total cost of 7). Note: AStarFoodSearchAgent is a shortcut for -p SearchAgent -a fn=astar,prob=FoodSearchProblem,heuristic=foodHeuristic. You should find that UCS starts to slow down even for the seemingly simple tinySearch. As a reference, our implementation takes 2.5 seconds to find a path of length 27 after expanding 5057 search nodes. Note: Make sure to complete Question 4 before working on Question 7, because Question 7 builds upon your answer for Question 4. Our UCS agent finds the optimal solution in about 13 seconds, exploring over 16,000 nodes. Remember: If your heuristic is inconsistent, you will receive no credit, so be careful! Can you solve mediumSearch in a short time? If so, we're either very, very impressed, or your heuristic is inconsistent. Sometimes, even with A* and a good heuristic, finding the optimal path through all the dots is hard. In these cases, we'd still like to find a reasonably good path, quickly. In this section, you'll write an agent that always greedily eats the closest dot. ClosestDotSearchAgent is implemented for you in searchAgents.py, but it's missing a key function that finds a path to the closest dot. Hint: The quickest way to complete findPathToClosestDot is to fill in the AnyFoodSearchProblem, which is missing its goal test. Then, solve that problem with an appropriate search function. The solution should be very short! Your ClosestDotSearchAgent won't always find the shortest possible path through the maze. Make sure you understand why and try to come up with a small example where repeatedly going to the closest dot does not result in finding the shortest path for eating all the dots. In order to submit your project, run python submission_autograder.py and submit the generated token file search.token to the Project 1 assignment on Gradescope.